This post contains affiliate links. I make a small commission when your purchase through these links at no extra cost to you. Thank you for supporting this website! I adore fall and Thanksgiving, but there is nothing more magical than Christmas and the Advent season leading up to it. I grew up in a church that celebrated the four weeks of Advent and it is a tradition I have continued to celebrate with my family in our home. I love the anticipation and hope leading up to the birth of our Savior Jesus Christ, as well as the extraordinary circumstances surrounding His entrance into this world. So many of my early years as a mom were spent OVERDOING Advent. I bought every resource and tried to do every craft and it drove all of us CRAZY. Learn from me and KEEP IT SIMPLE this Advent. I’m sharing a few of my favorite resources here today. Some of these are new to us and some are tried and true, but if they don’t fit your family, do not feel the pressure to buy it! ONE MORE THING: If you choose to order any of the following books (or any books from Amazon) yet this month (November 2018) use the code NOVBOOK18 to get $5 off your $20+ book purchase! I wrote about reading through the Jesus Storybook Bible for Advent EIGHT years ago and it is still one of my most visited blog posts! We love this tradition because of the simplicity and other families obviously feel the same! Six years ago, I added a printable to help guide you through the reading. The basic idea is to start with the first chapter of the Jesus Storybook Bible on December 1, read one story a night, and end with the final story about Jesus’ birth on Christmas Eve. This is meant to be something kids can connect with, but it brings tears to my eyes multiple times throughout the Advent season every year. It really is a beautiful way to anticipate the birth of Christ together as a family. This one is for you, moms. Pray the Word Journal is a resource we’ve developed from The MOB Society to help the busy mom prioritize prayer in her life. This is the prayer journal I use on a daily basis. We have quarterly editions, but this year, we put together a beautiful Advent edition! You can order yours for just $15 right now, but it may not arrive in time for the first few days of Advent. If you want to have your journal in time for the first day of Advent, a digital edition will be available soon. This is a new tradition we’re excited to try this year! We’ve done lots of different daily Advent activities with the kids through the years and I’ve loved the many different ways to focus on the important things this time of year. The Giving Manger is about sharing Jesus’ love with those around us during the Advent season. When a family member does something kind for someone else, they put a piece of straw in the empty manger. The point is to fill it and prepare for Jesus’ birth. There is also a book to accompany the manger to help kids understand the concept. I love the focus on giving back instead of getting gifts! My favorite daily devotional is New Morning Mercies by Paul David Tripp. I feel inspired and challenged every time I open it. 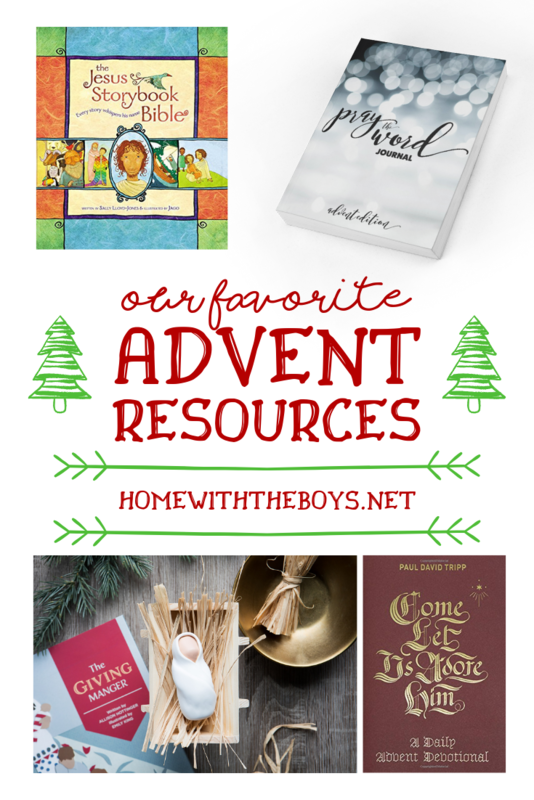 I was thrilled to see Tripp had written an Advent devotional! This will be my first year using Come Let Us Adore Him, but based on his previous work, I feel pretty confident in recommending it – and maybe you’ll join me in reading it this year, too! Let me know in the comments if you do and we can find a way to check in and share our thoughts! PLEASE REMEMBER: You don’t have to do ALL THE THINGS to celebrate Advent and Christmas in order to make memories. Let me know what your family loves to do this time of year and if you try any of these and love them, too!